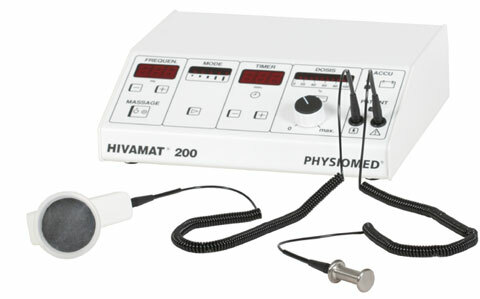 HIVAMAT® is a unique, patented treatment method. This advanced therapy gets its name from a description of what it does: (HI) Histological (VA) Variable (MA) Manual (T) Technique. It utilizes an intermittent electrostatic field to create what is known as Deep Oscillation. These electrostatic waves create a kneading effect deep within the damaged tissues, rapidly relaxing muscles, alleviating pain, and reducing swelling while restoring flexibility and blood supply to the affected area. Its special structure allows biologically effective oscillations in the treated tissue using electrostatic attraction and friction. In contrast to other therapies, these pleasant oscillations have a gentle and deep-acting effect on all tissue components (skin, connective tissue, muscles, blood and lymph vessels). With HIVAMAT® therapy, swelling, redness, and edema can be relieved pre- and post-operative considerably faster than with conventional therapies. Because it can be used at an extremely early stage, wound healing processes are stimulated and accelerated, local inflammation is inhibited and pain is significantly reduced over a sustained period. Scar quality is improved. Trauma c and neurological damage. For traumatic and neurological injuries and damage, HIVAMAT® has a significant edema-reducing effect, directly stimulates self-mobilization in areas relieved of pain, and enables an earlier return to active forms of therapy and activities of daily living. In brain stroke rehabilitation, it is used for gentle and effective lymphatic drainage.